Produced in a small edition in 1985 for an Amsterdam-based publisher, the book contains 20pp of Haring's characteristic creations produced as b/w line drawings. Born in 1958, New York graffiti artist Keith Haring rose to prominence in the 1980s, quickly becoming one of the best known of the city's new wave of artists. His exuberant, idiosyncratic style eventually became one of the most widely recognised visual languages of the 20th century. 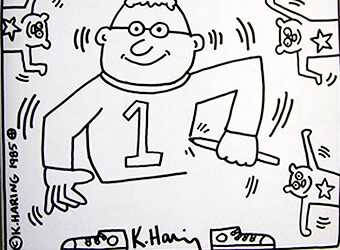 Keith Haring died in 1990.